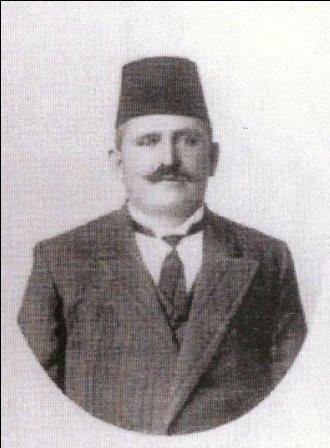 Kapidan Marka Gjoni was born in Orosh, Mirdita in 1861 and died in 1925. In 1883, Preng Bibe Doda was betrayed and subsequently caught and sent Kostamun. Mirdita was occupied and the houses of Gjomarku in Orosh were burned down. The ‘League of Prizren’ was considered abolished. The House of Gjomarku fell under great distress. The eldest was now Kapidan Marka Gjoni, 22 years old, who took the lead of the House of Gjomarku and Mirdita. After many years of turmoil the House of Gjomarku was once again restored to its greatness at the lead of Kapidan Marka Gjoni. Marka Gjoni rebuilt the former palaces of Lleshi i Zi in the Gorge of Orosh, which were burnt by the Turks after the ‘League of Prizren’ in 1883 and there he settled permanently. At the request of some Catholics in Shkodra Kapidan Marka Gjoni, who was involved in activities against the Turks, expressed his opinion to Mons. Doci, the Abbot of Orosh, to conjoin and reopen the church of “Our Lady of Shkodra” in Bachallek, which had remained closed since Shkodra fell in the hands of the Turks in 1479. Mons. Doci, after a slight hesitation based on good reason, as he was being observed by the Turkish government for national activities since the time of the ‘League of Prizren’, for which he was interned, took into consideration the importance of this critical Catholic matter and accepted it. On April 26, 1889, (exactly 410 years later) he conducted the first Mass. Abbot Doci administered that masterpiece as a religious mission by explaining: “Whenever and wherever it is requested from the people to give the Holy Mass, I, as a religious man, cannot decline.” It was a very important religious and political event. Marka Gjoni had the support of two people from Shkodra in this movement: Palok Kurti and Kole Deda, of the House of Dede Jakupvet, who was a considerable power among Catholics in Shkodra, in the area of Qafe Hardhi, behind Rozafa castle. From there, Marka Gjoni was informed not to go toward the bazaar because a crowd of Muslims from Shkodra lied in ambush waiting for him and that he would be better off to pass via Qafe Hardhi. They helped Marka Gjoni without shedding any blood. However, Marka Gjoni did not stop his momentum and we see him again in 1890 leading the clergy and the people to the Church of “St. Mark” in the village of Vau Dejes, and there among the ruins, the Holy Mass was celebrated. Later on, Bibe Ndue Pernoca, along with the people of Fan, put bells in the church of Prizren. In 1897 he went to Shkodra where he was caught, suddenly and treacherously and was immediately sent to St. Gjon where he was put on a ferry and sent to Istanbul. From there he was sent to Mosul in Iraq, on the border with Persia. He was exiled there for five years. Soldier Ndoc Ndreca was named Deputy Governor of Mirdita. After five years, Marka Gjoni, with the help of nuns, escaped from exile in Mosul dressed as a pilgrim, wearing a beard and pulling a donkey, bought for that purpose. He infiltrated a caravan of Bedouins and set off to Mecca, alleging to be a pilgrim. A few weeks later the journey changed direction and headed to the Russian border, and there, after much hardship he convinced the Russian border guards that he was not a Bedouin but an Albanian Catholic who escaped from Mosul where he was exiled. From there he went to Odessa and boarded a Russian ferry boat down to the port of Bulgaria. From Bulgaria, after many difficulties, he reached the harbor of Kotor, a city under the rule of the Austro-Hungarian Empire. He had friends from Shkodra there who welcomed him lovingly and helped him for as long as he stayed in Kotor. The news immediately reached Vienna and the Austrian Foreign Ministry sent its officer, Tef (Stefan) Curan, who was from Shkodra and a friend of Marka Gjoni, to Kotor for discussions. Marka Gjoni missed his dear family and Mirdita and as a result decided not to go to Vienna. And so they both left for Durres by Austrian ferry, hoping that they could pass the border without being noticed or recognized, but some of the migrants knew Marka Gjoni and afraid that he would be discovered they returned to Kotor on the same ferry. After six months he set out from Kotor on an Albanian boat and landed on the shore of Mat and from there he passed through Lezhe and entered Mirdita. On his way to Mirdita, he came along some people of Mirdita who knew him and joined him. The news spread immediately because the Gorges rattled from the shooting rifles. With- in a very short period of time, Marka Gjoni, who was escorted by a group of people from Mirdita, arrived in Orosh. The house of the Kapidan was filled with many friends who traveled from other regions to welcome and congratulate him and wish him well. The coterie of Gjomarku revived, rejoiced and became enthusiastic, but Marka Gjoni was not indifferent to the national matters and immediately recommenced the anti-Turkish activity. In 1921 to defend catholicism and protect the independence of Mirdite, Kapidan Marka Gjoni led a rebellion against the Albanian regency and parliament, which was established after WWI. Backed by Yugoslavia he led his Roman Catholic Mirdite followers winning the conflict and thus proclaiming in Rreshen the founding of an independent “Republic of Mirdita”. Marka Gjoni was the only president of the Republic. The Republic only existed between July 17 and November 20, 1921, as it violated the sovereignty of the Albanian state, Albanian government troops fought and eventually extinguished the republic. Marka Gjoni was married to Dava Vlad Markagjoni. They had four daughters and one son, Gjon Marka Gjoni who, upon his father’s death in 1925, inherited the title of Kapidan and all duties associated with it. The historical photo above was taken in Mirdite in the late 1800’s. Seated is my great-grandfater, Kapidan Marka Gjoni with his “djelm” (young leaders). Standing behind him clockwise are (1) Llesh Nekolle Prenga of Oroshi (2) Dode Marka Doda of Oroshi (3) Marka Kola of Oroshi and (4) Per Ndue Lleshi of Kashnjeti.